Turns out Bobby likes snow. 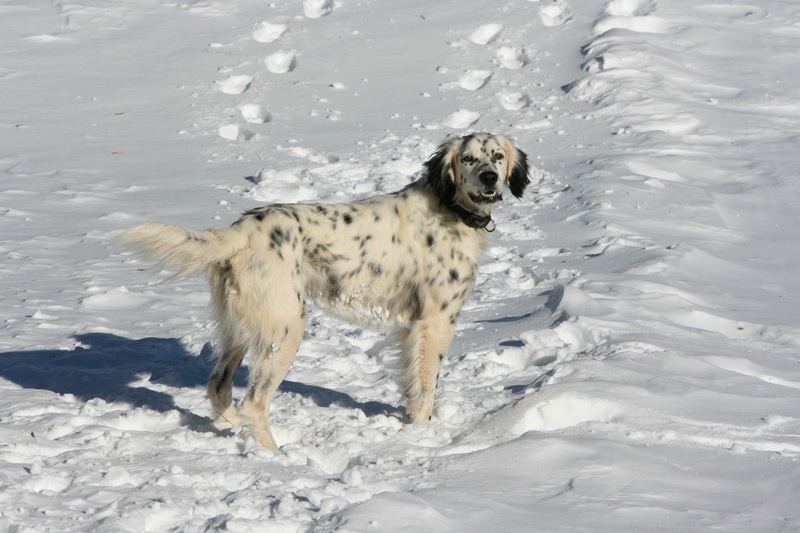 Well, mostly he likes being around the boys I think, so when they go out to play in the snow he goes along. Francie thought it weird that Bobby came out in the snow. Bobby thought it weird that Francie didn't stay in the shelter with her hay. Bobby thought snow was fun! He leaped and jumped and ate bits of snow. He chased his own shadow. But then? Then Bobby got alarmed. Bobby arched his back and puffed his fur like the abominable snow cat. The source of so much drama? Yeah, this guy. Naughty bird dog! How adorable! I never saw a cat play in the snow before (mostly because the cats in our family have always been house cats). Unfortunately, we don't have our own cat because my husband is extremely allergic. It's so much fun to watch animals in the snow. I love the little bunny in the picture looking at your horse...so, so, cute! Happy Friday Lisa. Oh, I love these pictures. Bobby sure was having fun in the snow. It has been "interesting" introducing my 5 cats to our new dog - lots of puffing up and hissing! Our cats will deal with snow but avoid it if possible. Dogs just have fun no matter what but when it is real cold I don't have trouble getting any of them to go back to the house. You do have a snow cat. Most of our cats have the dogs pretty much bullied these days. They just swipe at em whenever the dog gets close. Not sure how that situation changed but it did. I think the dog got old. None of the cats like the snow though. The catz were asking me for warmth yesterday. Had a cute black baby show up while we were moving sheep around.Have all the critter out at the new place, I hope they like the larger area.Need to do a lot of fence in the spring. That is just sweet... Bobby makes an adorably 'abominable' snow cat! eerlijk om dat zo te zien spelen. ... the dog is always blamed.... LOL..
so cute! 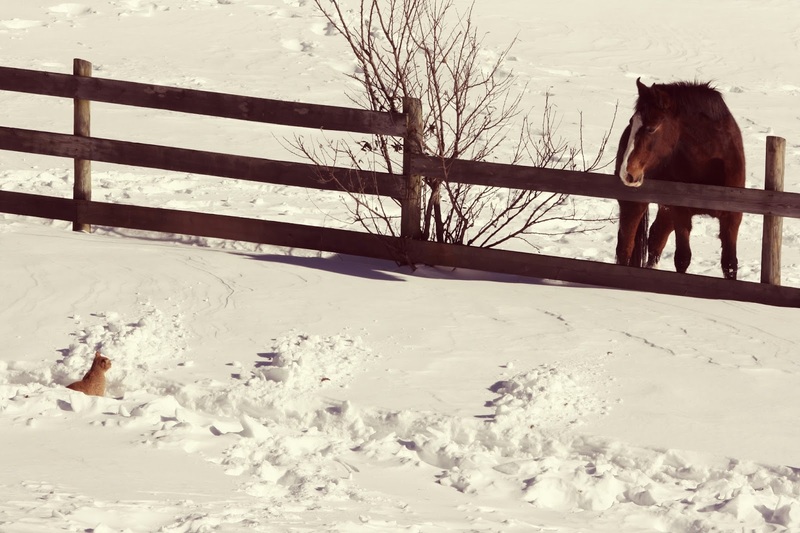 and adorable fence face-off shot! Sweet to see Bobby enjoying the snow! Oh you captured the best photos!! Look at Bobby arching up!! Bobby looks so tiny in the photo with Frannie! 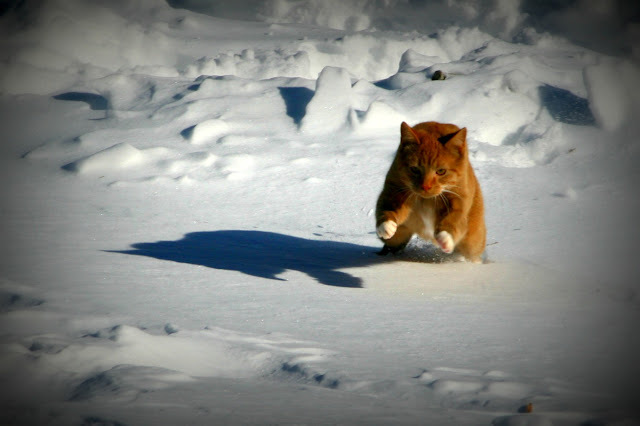 That is an awesome photo of him running in the snow. He is a beauty! Great pictures. You folks have a great rural life going on there. As far as I can tell, it's just about perfect. My Hobbes used to like the snow like that when he was younger. Now, he likes the fireplace so much better. So, cute. Cats playing in snow how fun that must have been. My poodle loves the snow so much she rolls in it. She comes in with little snow balls stuck in her curls. 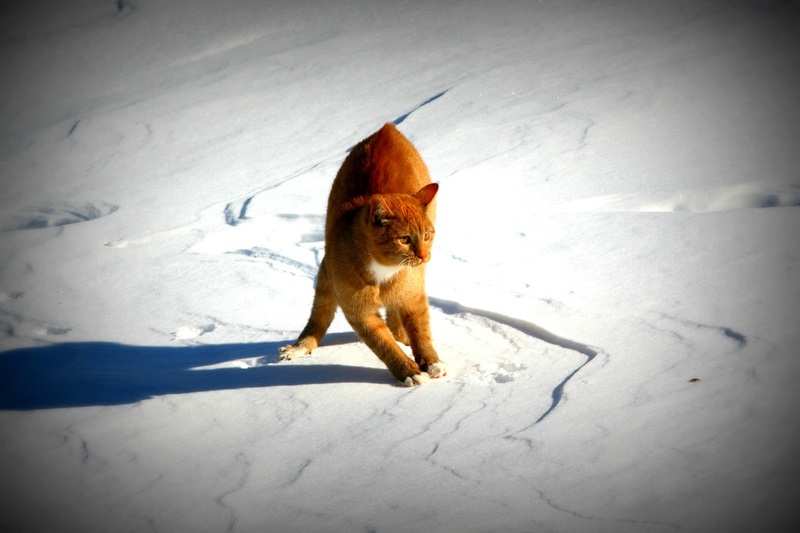 My cat follows me everywhere, even on the frozen wetland! Glad to see another 'normal' cat!!! Our snow has all melted. (ツ) from Cottage Country Ontario , ON, Canada! I love these pictures! Great shots, my friend! That's so funny! I thought cats hated things like baths and snow. Humans have different likes and dislikes; I guess other animals are the same way.